On February 17th we received sad news. In the early morning of Lavin from our therapy project died in the hospital in Kijabe, 300 km from Kisumu. Lavin was there for a foot operation. After examination in 2012 she was diagnosed as suffering from sickle cell anaemia, a hereditary disease which means that red blood cells do not develop the right way. The disease is incurable. The operation on her foot entailed risks. The hospital in Kijabe is a specialised in orthopaedic operations. The operation went well but afterwards there were complications. Lavin was brought to another hospital with breathing problems but this hospital could do nothing for her. Her mother was with her from the moment she was admitted to hospital. An elder sister was present in case of an emergency blood transfusion. Lavin had participated in the therapy project since April 2011. She developed slowly from her birth on and was diagnosed sickle cell anaemia in 2012. Amara Foundation has supported Lavin and her parents by compensating for the costs of therapy, transport to therapy, extra nutrition and medication. The last two clearly had a good effect. We saw her change from a weak and often ill girl into a lively girl who looked good and healthy. In January 2014 she proudly started at the primary school of the Disciples of Mercy in a ‘special needs’ class, which she was enthusiastic about. The last few years we saw her change into a real ‘big girl’. Whenever we were in Kisumu we always visited her at school and saw her together with her mother at therapy, always a nice, open contact which we really enjoyed. The board of Amara Foundation is shocked by this sudden news. Our thoughts are with her family, the close group of mothers and children of the therapy project, Samoo and John her therapists, her fellow classmates, the teachers of the Disciples of Mercy and everyone that will miss her. We wish all of you the strength to carry this burden. During their working visit to Kisumu Maria and Lisanne will visit Lavin’s family. In remembrance of Lavin we will present the family with three framed pictures of Lavin and a booklet with pictures of Lavin of the past few years. We will also discuss with Samoo if other (financial) help is needed at the moment. At the moment 15 children participate in the project. If necessary Amara Foundation will pay the expenses for travelling costs to therapy, medication, extra nutrition, appliances (braces, wheelchair, standing/sitting chair) and education. As from May 1st 2018 12 out of the 15 children attend school at a day school or a boarding school. During the four-month school holiday all children go to the ergo therapy department of the Jaramogi Odinga Odinga (JOOTRH) hospital in Kisumu. The frequency of going to therapy varies from once a week to four times a week. Two children already go to the JOOTRH therapy department during the year, for one child we made a deal with the hospital in Bondo for weekly sessions. The reason is that she lives closer to Bondo. The cooperation with the St. Anthony Home for multiple handicapped children in Awasi will be continued and support will be extended. Seven children of the therapy project live there. Therapy: in 2016 we made a start with financing this project. Initially one day a week, in 2018 two days a week. As from 1/1/2019 we pay the expenses of a full-time occupational therapist. Many of the around 30 children profit by intensive therapy. Sister Marcella told us that the children react positively to the therapy. 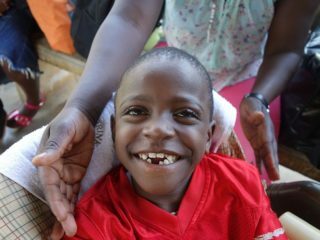 Care: in May 2018 we have started financing an extra carer because of all the care these children need. We will continue this in 2019. Nappies. 6 out of 7 children are not out of nappies so many nappies are needed. In 2019 we hope to introduce washable nappies (thanks to a donation by Nappy’s). It will be one of our points of attention during the visit of Maria and Lisanne. Cooperation with the Disciples of Mercy will be continued. They employ a qualified occupational therapist. During the four-month school holiday Amara Foundation will pay the wages of this therapist. In return he will work in the hospital all day, the other months he is in the hospital part of the afternoon. Payments. We will continue our monthly direct payments to the mothers through MPesa. Payments to boarding schools are done through the mothers or a direct transfer through the INTL-FStone bank in England. Last but not least: as from December 1st 2018 all children in the therapy project have a NHIF card (health insurance) which covers the whole family, father, mother and all children. Thank you again all contributors who made an extra donation to buy a card for one or more families. They cost € 5 a month/€ 60 a year for a family. All these expenses take up a large part of the contributors’ money. However, extra therapists in various places and an extra carer in Awasi have a very positive effect both on the multiple handicapped children in Awasi and the 15 children taking part in the therapy project. The positive impression we have of the various places where ‘our’ children are staying stimulate us to do our part wherever possible. thanks to the sponsoring of family, business relations, friends and challenges they raised a huge amount of money. On Thursday night January 3rd we had a special and festive evening: Amara Foundation received a cheque to the value of € 13, 290 from the Flying Dutzmen team. Roland, Jan and Dennis: thank you so much for this initiative and your warm heart for Amara! All contributors thank you! Dutz Eyewear which made it all possible: SUPER! In 2018 Nappy’s chose us as charity of the year. Last month the result was delivered to one of the board members. A box full of plastic pants with an assortment of disposable nappies, boosters, inlays. All together for an amount of more that € 700. The plastic pants are not only useful and environmentally friendly but also look good! Maria and Lisanne have already taken everything with them to Kenya. Ilka, the owner of Nappy’s has added a few plastic pants size S on our request for one of the children in the therapy project. One boy in the project needs a small adult size. The mother will be very happy as she now has to buy expensive Pampers every week. Her son now attends school and needs a nappy. Together with his mother we will instruct teachers how to use the plastic pants. The other plastic pants, for children up to 15 kilos, are meant for children at the boarding school in Awasi. The mothers and carers will also be instructed how to use the nappies and inlays. On behalf of the board of Amara and all the children and mothers in Kenya we thank NAPPY’S for all the material. From Nappy’s customers we also received a great number of used small sizes in good condition. We are going to deliver them at the address where they are useful. Also customers of Nappy’s: thank you! Like every year we were lucky to be invited to be present at Christmas markets at various locations. A number of these markets were already mentioned in the newsletter of December 2018, but not all of them. Evelien was allowed to put all her material in the staffroom of her school, the Heerbeeck Colllege in Best, for a full week. Apart from becoming acquainted with her foundation sales were fine as well. Colleagues, thank you all for buying so much! 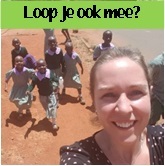 Carmen could fill a stall with Kenyan materials at primary school ‘t Stekske in Langenboom. There was great interest in everything and people found things that were not there last year. Primary school ‘t Stekske and all visitors, thank you. February/March: Jesse and Vincent, two first years of the Heerbeeck College in Best are collecting for Amara Foundation. They have also arranged for a bottle box to be placed at the Albert Heijn van Akkeren in Ulvenhout. Great, boys! March 29: at 20.30 a pub quiz will be organised in Gasterij ‘t Spitje in Mierlo on the occasion of Carolien having hosted this café for 15 years. The entrance fee of €3 will be donated to Amara Foundation. Super that such a special occasion is related to our foundation. Be welcome! April 7: in Berlicum a charity bridge drive is organised. The charity chosen is Amara Foundation! We will also sell Kenyan materials there. May: in this month the public library of Mill and St Hubert will pay attention to Amara Foundation. Our material will be on show in a show case. April/May/June: after presentations of two charities the youth council of Mill has unanimously chosen Amara Foundation thanks to a fine presentation by Kanye de Klein. In this period there will be various actions in Mill, St. Hubert, Wilbertoord and Langenboom. Are you the ICT expert we are looking for? Unfortunately our regular ICT specialist can no longer help Amara foundation due to personal circumstances. Annelies, thank you very much for all your help the past few years. Board member Evelien now monitors the website but needs help now and again, so we are looking for someone who can support us in the field of ICT. It will be for 1 or 2 years. Are you willing to contribute to a charity and do you have ICT skills, then we are looking for you! Please contact one of our board members or send a message to: administratie@amarafoundation.org. Working visit Kisumu Maria and Lisanne. When you read this message in the newsletter we, Maria and Lisanne, will already be in Kisumu. As always we are looking forward to it. The last few times we have posted messages on Facebook every few days. It is a useful way to inform everyone back home about ‘what are they doing there’. We are going to try this again this time. During the board meeting we made a ‘to do’ list we are going to work with. big bag with various materials, shoes, clothing, games, and private things that do not fit in the hand luggage. We are always very much relieved when we have passed safely through the customs in Nairobi. Follow Amara on Facebook and you will hear how everything is going. Maria Vermeer – Martine Plantinga and all the people from Kisumu! Copyright © 2019 Amara Foundation, All rights reserved. You receive this newsletter as a board member of Amara Foundation. You can update your preferences or unsubscribe from this newsletter.